This question is the cornerstone of TINYpulse Engage as it's our mission to make employees happier. Keeping that goal in mind, the Happiness question is the only pulse question that's scheduled on a regular cadence. We believe this will help you take a pulse on how your employees are feeling and if there are any issues of the moment that need your attention. The Happiness question is automatically scheduled according to your TINYpulse cadence. However, the timing of it can always be adjusted in the Pulses section of the Engage dashboard depending on whether you want to delay it or ask it sooner. You can move the Happiness question by dragging and dropping it to a new location, and doing so will move all future Happiness questions by the same number of weeks to preserve the cadence and benchmarking. In addition, you may edit the question text or provide a translation while still keeping the benchmarks by selecting the Edit option. Asking this question on a regular basis will also let you monitor overall happiness over time. 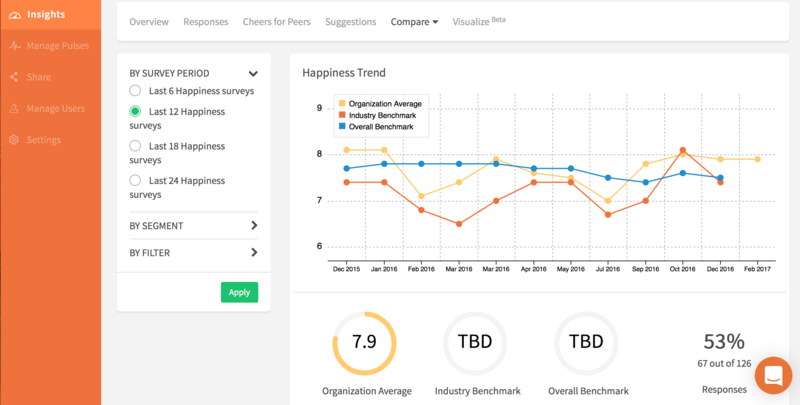 Just go to the Compare -> Happiness section in the administrator dashboard to see your company's happiness trend compared to the industry benchmark and the overall benchmark of all orgs using TINYpulse Engage.